Yesterday, our first full day of training (officially week 1, day 2 of camp), proved a relatively gentle introduction to the island. The winds were kind to the point of being non-existent when we left the Sands Beach Resort at 9:30 in the morning. For those unfamiliar with the island I made it a point to stress that this was weird, very weird. The remainder of the week, if the forecasts prove true, will not be so kind. We have a relatively small group of athletes on camp this week and if Mark and I thought this would prove an easy warm up we were wrong. Athletes seem to be quite well matched and on the climbs I’m often the one out the back, or acting as broom wagon as I like to call it. 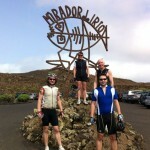 The route we took was relatively simple and avoided any of the major climbs. 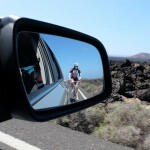 We started up towards Teguise, but turned short to sample the delights of the Nazaret road, the worst on the island, before descending to Famara on the opposite coast. From there, via La Santa and a brief stop for ice cream (my Lanza fuelling strategy), we climbed back through Tinajo and along the centre of the island to San Bartolomé taking a slightly longer route than originally planned. I suspect there was a little first day nerves and adrenaline in the group and at times the pace might have been a touch high. Or perhaps I’m merely reflecting how sore my own legs felt by the end. We’ll see how the other fare over the coming days; yesterday was easy in comparison. Mark and I then spent the afternoon walking back and forth along the side of the Sands Resort pool. We filmed each of the athletes from multiple angles as they swam. We’ll properly review the films later, but for the rest of camp we know what to look for in their stroke and what to work on within the subsequent swim sets. So swimming was genuinely gentle, well, expect for those who needed a hard 50m sprint to tire them out before we filmed. 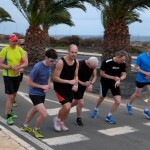 To round the day out we headed out for the 5.4K run race – five loops around an abandoned hotel building site. It’s as glamorous as it sounds. The loop isn’t easy, although the light winds helped today, but the six runners attacked the race and there was a tight battle at the front with Simon Barry beating out Leahn Parry by a mere 5 seconds in the end. When they could finally get themselves up off the pavement we sent the athletes off on a cool down run before they headed in for dinner. The first training day was done. So far so good. It was a pretty successful day, the ride proved a good introduction and the group seems to be riding well together. 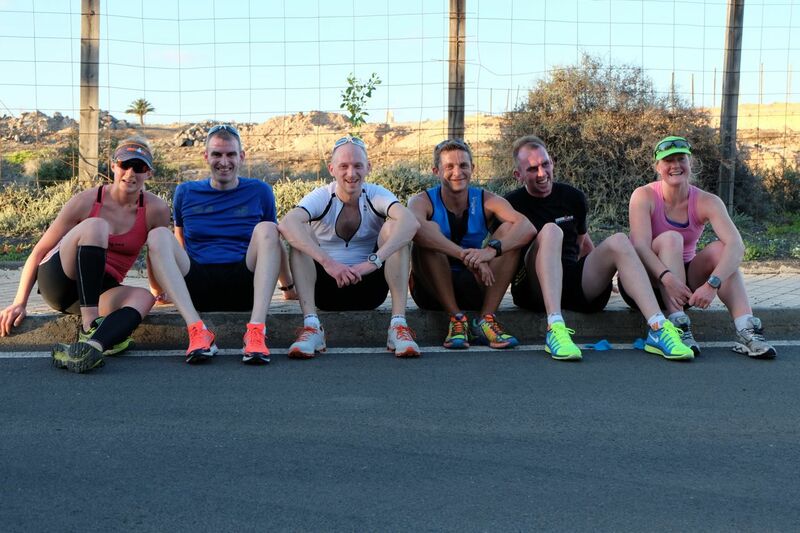 We’ve seen everyone’s strokes and know what to look for in the week ahead and we finished with a very hard run. 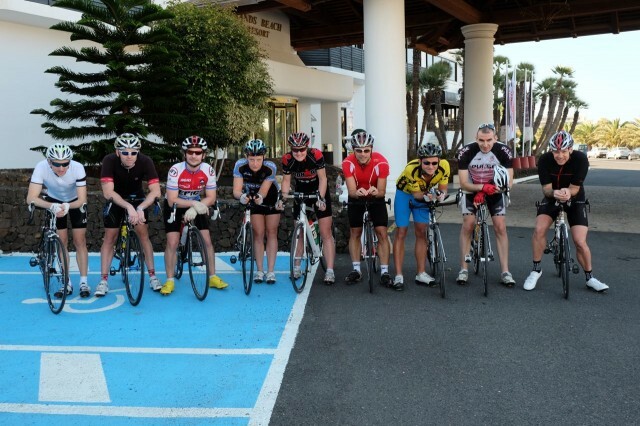 Everyone looked suitably tired at dinner, even the coaches and we’d only done the ride. Monday is a bigger day though, a bit more biking, a lot more swimming and perhaps some running. Lanzarote Camp Day 1 – Where are we Going?